From Ottawa Hospital Research Institute and University of Ottawa (J.W. ); University of Calgary (M.T.G. ), Canada; and the Department of Pathology (M.S.G., J.M.M. ), VU University Medical Center, Amsterdam, the Netherlands. Objectives: To identify the epitope on α-synuclein (α-syn) to which antibodies against the Epstein-Barr virus (EBV) latent membrane protein 1 (LMP1) bind and to determine whether antibodies targeting this mimicry domain are present in human sera. Methods: Reactivity of the α-syn-cross-reacting anti-LMP1 monoclonal antibody CS1-4 to a synthetic peptide containing the putative mimicry domain was compared to those in which this domain was mutated and to murine and rat α-syn (which differ from human α-syn at this site) in Western blots. Using ELISA, sera from EBV+ (n = 4) and EBV− (n = 12) donors as well as those with infectious mononucleosis (IM; n = 120), and Hodgkin disease (HD; n = 33) were interrogated for antibody reactivity to synthetic peptides corresponding to regions of α-syn and LMP1 containing the mimicry domain. Results: CS1-4 showed strong reactivity to wild-type human α-syn, but not to the mutant peptides or rodent α-syn. Control EBV− and EBV+ sera showed no reactivity to α-syn or LMP1 peptides. However, a significant proportion of IM and HD sera contained immunoglobulin M (IgM) (59% and 70%, in IM and HD, respectively), immunoglobulin G (IgG) (40% and 48%), and immunoglobulin A (IgA) (28% and 36%) antibodies to both peptides, as well as a significant correlation in the titers of IgM (ρ = 0.606 and 0.664, for IM and HD, respectively), IgG (0.526 and 0.836), and IgA (0.569 and 0.728) antibodies targeting LMP1 and α-syn peptides. Conclusions: Anti-EBV-LMP1 antibodies cross-reacting with a defined epitope in α-syn are present in human patients. These findings may have implications for the pathogenesis of synucleinopathies. Epstein-Barr virus (EBV) infects over 90% of the human population. Following acute infection, which can manifest as infectious mononucleosis when acquired in adolescence or adulthood, EBV establishes lifelong latency in B-lymphocytes. Acute and latent infection are characterized by the generation of antibodies to a variety of EBV-encoded proteins. Some of these exhibit homology with host proteins, resulting, through molecular mimicry, in the generation of autoantibodies targeting endogenous host proteins. We have reported that antibodies targeting the EBV latent membrane protein 1 (LMP1) cross-react avidly with α-syn.8,9 Basic local alignment search tool (BLAST) analysis of the 2 proteins revealed linear homology consisting of a PVDPDN motif in the C-terminus of α-syn and 4 PQDPDN sequences within the C-terminal region of LMP1. We have hypothesized that this example of molecular mimicry may have implications with respect to the development of anti-α-syn autoantibodies and for the pathogenesis of PD.9 The objectives of the present study were (1) to determine whether the PXDPDN sequence represents the LMP1/α-syn mimicry domain and (2) to use synthetic peptides containing this domain as a tool to determine whether sera from healthy EBV-negative and EBV-positive donors as well as from patients with elevated expression of LMP1 (infectious mononucleosis [IM] and Hodgkin disease [HD]) harbor antibodies targeting this mimicry domain. Serum samples were obtained from the archives of the VU University Medical Center. These were collected during 1996–2010 as part of collaborative studies on the diagnosis of EBV-associated acute and malignant diseases. Written informed consent was obtained from study participants at the time of collection. Wild-type α-syn-GFP plasmid was obtained from Origene (RG210606; Rockville, MD). α-syn-GFP mutants were created by site-directed mutagenesis with the following primers (Invitrogen, Life Technologies, Burlington, Canada): for N122S (PVDPDS): fwd: 5′-GTGGATCCTGACTCTGAGGCTTATG-3′; rev: 5′- CATAAGCCTCAGAGTCAGGATCCAC-3′; for D121S (PVDPSN): fwd: 5′- CCTGTGGATCCTTCTAATGAGGCTTATG-3′; rev: 5′- CATAAGCCTCATTAGAAGGATCCACAGG-3′. Briefly, wild-type α-syn-GFP was amplified in the presence of either primer pair using Vent DNA polymerase (M0254L; New England Biolabs, Ipswich, MA) to produce a blunt-ended product. Resultant PCR products were digested with DpnI restriction enzyme (New England Biolabs) to remove parental methylated DNA. The remaining DNA was purified, ligated, and transformed into NovaBlue Singles competent cells (EMD Millipore, Billerica, MA). Plasmids obtained from ampicillin-resistant clones were sequenced by StemCore Laboratories (Ottawa, Canada) using a primer complementary to the CMV promoter (5′-AAA TGG GCG GTA GGC GTG-3′). LMP1 expression vector (p1990 SV40-LMP1) was created by Bill Sugden and obtained from Addgene (26654; Cambridge, MA). Transfection of cells in culture. H1299 cells were plated in 6-well dishes at a density of 5 × 104 cells per well and transfected 24 hours later using GeneJuice Transfection Reagent (70967-6; EMD Millipore ) following the manufacturer's protocol. For each transfection, 3 μL of GeneJuice reagent was incubated with 290 μL of serum-free Dulbecco Modified Eagle Medium (Corning Cellgro, Manassas, VA) for 5 minutes. One microgram of plasmid DNA was then added to each reaction and incubated at room temperature for 20 minutes. This solution was then added dropwise to cells. Forty-eight hours post-transfection, medium was removed and cells washed twice in phosphate-buffered saline. Cells were lysed in 20 mM HEPES pH 7.4 with 2 mM EGTA, 50 mM β-glycerol phosphate, 1% Triton X-100, 10% glycerol, 1 mM dithiothreitol, 1 mM phenylmethanesulfonyl fluoride, 1 mM sodium orthovanadate (Na3VO4), 5 mM sodium fluoride, and 2 mM sodium pyrophosphate (Na4PPi) and then sonicated with a Fisher Sonic Dismembranator Model 300 (Fisher Scientific, Ottawa, Canada). Lysates were then centrifuged for 15 minutes at 16,000 × g to pellet debris. Supernatants were collected and stored at −80°C until use. Postmortem human frontal cortex from an 85-year-old woman with dementia with Lewy bodies was obtained from the neuropathology frozen tissue bank at The Ottawa Hospital, Canada. Permission for tissue use in research was obtained prior to autopsy. Whole brain from 129/Sv mouse and Wistar rat were obtained in accordance with a protocol approved by the University of Ottawa Animal Care Committee. These animals were chosen because the PXDPDN motif in their α-syn (PVDPGS in mouse and PCDPSS in rat) contains 2 of the few amino acid sequence variations that differ from human α-syn (PVDPDN). A 3-month-old female mouse was obtained from wild-type offspring of heterozygous crosses from a transgenic mouse line derived from 129/Sv ES cells.10 Wistar rat brain was obtained courtesy of Dr. Leo Renaud (Ottawa, Canada). Tissues were lysed in the same buffer as cells (above) at approximately 2 mL/g of frozen tissue and homogenized using a PowerGen 125 homogenizer mixer (Fisher Scientific). Resultant lysates were sonicated, centrifuged, and stored as above. Western blotting was performed as described previously10 with the following antibodies: anti-LMP1 (1:250; Dako, clone CS1-4, Glostrup, Denmark), anti-α-syn (EP1646Y; 1:10,000; Abcam ab51252, Cambridge, UK), and anti-β-actin (1:5,000; Sigma A2228, Munich, Germany). Between antibody exposures, the membrane was stripped to remove previous immunoreactivity (Thermo Fisher Scientific 46430, Waltham, MA). Blots shown are representative of at least 3 separate experiments. Polystyrene ELISA plates (Corning Costar 9018) were coated overnight at 4°C with 1 μg/mL peptide in 50 mM sodium carbonate buffer (pH 9.6). The α-syn and LMP1 peptides containing the PXDPDN epitope are shown in table e-1 at Neurology.org/nn. For analysis of EBV serostatus, purified synthetic multiepitope peptides corresponding to viral capsid antigen (VCA) and EBNA-1 were obtained from Cyto-Barr BV (Zuidhorn, the Netherlands) and used for coating 96-well ELISA plates as described previously.16 Nonspecific binding sites were blocked for 1 hour at 37°C with phosphate-buffered saline (PBS) containing 3% bovine serum albumin (BSA). All incubations were carried out for 1 hour at 37°C, followed by 4 washes in PBS with 0.05% Tween. For the detection of IgA and IgG antibodies, human sera were diluted (1:100) in sample buffer (PBS, 0.05% Tween, 0.1% Triton X-100, 1.0% BSA). For the analysis of immunoglobulin M (IgM) antibodies, human sera were treated with GullSORB (Meridian Bioscience, Inc., Cincinnati, OH). The latter was employed to remove immunoglobulin G (IgG) antibodies, which are smaller than IgM and may competitively block IgM bonding sites, and to block IgG-rheumatoid factor (anti-IgM), which, when present in the sample, may result in false-positives responses via complexed IgM. Horseradish peroxidase (HRP)–conjugated secondary antibodies diluted in sample buffer were then applied to detect bound human IgM (Dako P0215 lot 036; 1:1,000), IgG (Dako P0214 lot 12; 1:4,000), immunoglobulin A (IgA) (Dako P0216 lot 055; 1:8,000), or antimouse immunoglobulin (Dako P0260 lot 00077729; 1:1,000). HRP activity was visualized using 3, 3′, 5, 5′- tetramethylbenzidine solution with sodium acetate–trihydrate and 3% hydrogen peroxide. Activity was suspended by adding 1 M sulfuric acid. Optical density (OD) was determined at 450 nm (Synergy HT; Bio-Tek, Winooski, VT). Cutoff value (CoV) was defined as the mean OD450 value of 3 EBV-negative sera plus 2 times SD, which was used for normalization in each ELISA experiment (OD450/CoV). Normalized values ≥1.0 were considered positive. Confirmation of the LMP1/α-syn mimicry domain. To determine whether the homologous PXDPDN sequence on LMP1 and α-syn represents the binding site for the CS1-4 cross-reactive antibody, we performed site-directed mutagenesis of this epitope (→PVDPSN and →PVDPDS) of the full-length human α-syn protein. By Western blot, CS.1–4 displayed strong immunoreactivity with wild-type α-syn but reduced signal with the PVDPDS mutant and no signal with PVDPSN (figure 1, right panel). The control anti-α-syn antibody EP1646Y demonstrated immunoreactivity at similar molecular weights (∼14 kDa for wild-type α-syn or ∼41 kDa for α-syn-GFP), confirming the presence of α-syn even in the absence of the epitope recognized by CS.1–4 (figure 1, right panel). Western blots show (left) CS.1-4 reacts only with human α-syn whereas EP1646Y recognizes α-syn across species. (Right) CS.1–4 reactivity with human α-syn is abrogated by substitutions in the PVDPDN motif. Binding of EP1646Y to an epitope outside that motif is unaffected. β-actin is a loading control for all lanes. LMP1 = latent membrane protein 1. In order to provide in vivo confirmation of this, we exploited the fact that the PXDPDN motif contains 2 of the few amino acid sequence variations that distinguish human (PVDPDN) and mouse (PVDPGS) or rat (PVDPSS) α-syn. We confirmed that CS.1–4 reacts with human α-syn by Western blot but does not recognize the homologous protein from mouse or rat (figure 1, left panel). These studies confirm that CS.1–4 recognizes human α-syn through the PVDPDN motif. Moreover, they indicate that the terminal asparagine (N122) allows for strong binding by CS.1–4. However, the second aspartate residue (D121) is essential for recognition. Detection of cross-reactive antibodies in control donors and patients with IM. Healthy EBV+ donors (n = 16), as well as patients with IM (n = 120) and patients with HD (n = 33), showed characteristic patterns of immune reactivity to VCA and EBNA-1, respectively (figure e-1). We next analyzed the presence of antibodies to 2 peptides shown in table e-1: (1) peptide L1, a 57 amino acid peptide corresponding to the c-terminus of LMP1 and containing 2 PQDPDN domains; and (2) peptide A, a 30 amino acid peptide corresponding to the c-terminus of α-syn and containing one PVDPDN domain (amino acid sequences shown in table e-1). Control EBV− donors as well as healthy EBV+ samples displayed no IgM, IgG, or IgA responses against either peptide (figure e-2). A proportion of patients with IM demonstrated responses to peptide L1 and peptide A with a smaller proportion exhibiting responses to both peptides (table 1 and figure 2A). As a group, figure 2A reveals that patients showed a bias towards IgM responses to peptide A as only this group showed a median reactivity significantly above the cutoff threshold of 1.0. 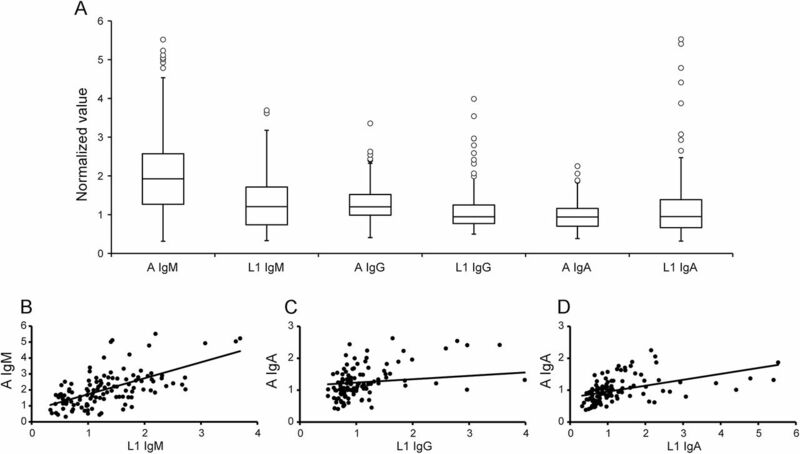 (A) Boxplot shows immunoglobulin M (IgM), immunoglobulin G (IgG), and immunoglobulin A (IgA) antibody responses (vertical axis = average normalized OD450 value) to α-synuclein (α-syn) (peptide A) and latent membrane protein 1 (LMP1) (peptide L1) in IM sera. Values >1 are considered significant. Boxes enclose the 2nd and 3rd quartiles. The horizontal line denotes the median. Whiskers delimit 1.5 interquartile ranges from the median with outliers indicated by circles. (B–D) Scatterplots show strong correlation of normalized OD450 values for IgM (B), IgG (C), and IgA (D) reactivity to peptide A (vertical axis) and peptide L1 (horizontal axis). Each point represents 1 patient with IM. Spearman ρ = 0.606, p = 2.2 × 10−13 for IgM; 0.526, p = 6.83 × 10−10 for IgG; and 0.569, p = 6.65 × 10−13 for IgA. Spearman rank correlation analysis of normalized values in individual donors revealed a highly significant correlation in the intensity of reactivity to peptides A and L1 for IgM (ρ = 0.606), IgG (0.526), and IgA (0.569) (figure 2, B–D). HD is classically a disease with high LMP1 expression in a type II latency pattern resulting from remote infection. More HD sera reacted to peptide L1 than peptide A (table 2 and figure 3A). Again, the majority of the positive patients demonstrated antibodies to both peptides (table 2). The responses of patients with HD to peptides A and L1 were reduced compared to those observed in patients with IM. However, similar to patients with IM, figure 3A reveals a bias towards IgM reactivity, but this time to peptide L1, as the median value for this was the only one significantly above the 1.0 threshold. There were strong correlations between the intensity of the responses to the peptides among individual patients for IgM (ρ = 0.664), IgG (0.836), and IgA (0.728) (figure 3, B–D). (A) Boxplot shows immunoglobulin M (IgM), immunoglobulin G (IgG), and immunoglobulin A (IgA) antibody responses to α-synuclein (α-syn) (peptide A) and latent membrane protein 1 (LMP1) (peptide L1) in HD sera. Vertical axis, box limits, horizontal lines, whiskers, and circles as for figure 2. 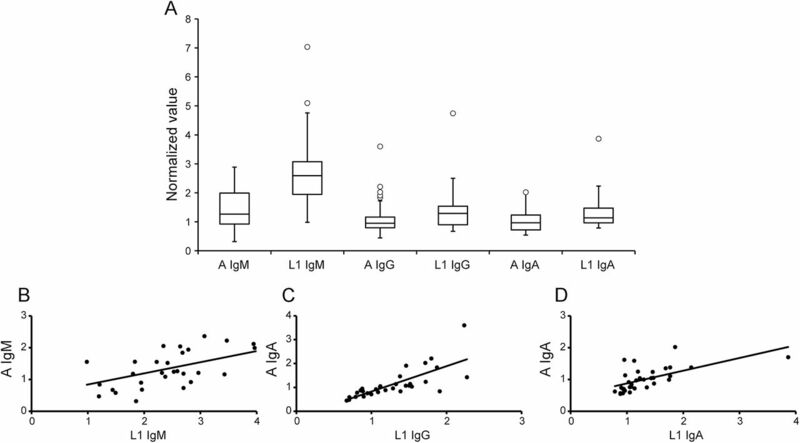 (B–D) Scatterplots show strong correlation of normalized OD450 values for IgM (B), IgG (C), and IgA (D) reactivity to peptide A (vertical axis) and peptide L1 (horizontal axis). Each point represents 1 HD patient. Spearman ρ = 0.664, p = 2.51 × 10−5 for IgM; 0.836, p = 1.33 × 10−9 for IgG; and 0.728, p = 1.57 × 10−6 for IgA. The PXDPDN sequence is crucial for antibody binding in human sera. To further confirm that the anti-LMP1 responses we detected in human sera were dependent on PXDPDN and not directed against other epitopes in the long 57 amino acid L1 peptide, we developed 2 shorter LMP1 peptides (table e-1): peptide L2, corresponding to the N-terminal half of peptide L1 (amino acids 1–26 of L1) containing 2 PQDPDN motifs; and peptide L3 (amino acids 14–41 of L1), containing only the second PQDPDN motif. This analysis was performed in a subset of patients with IM and HD who had IgM and IgG responses to peptide L1. The large majority of IM sera displayed reactivity to peptide L2 (figure e-3A and table e-2) and peptide L3 (figure e-3A and table e-3), indicating that the IgM and IgA responses are not generated against epitopes located between amino acids 27–57 or 1–13 of L1 and strongly suggesting that PQDPDN is the predominant target in IM. The results for IgG are interesting, however, and indicate that 30%–40% of the anti-LMP1 IgG responses in patients with IM are generated against non-PQDPDN epitopes in the c-terminus of LMP1. Relative to those observed in IM sera, L1-positive HD sera showed lower IgM, but similar IgG reactivity against L2 and L3 (figure 3A, figure e-3B, and tables e-2 and e-3). The IgM and IgG reaction to peptide L3 in these patients suggests that the anti-LMP1 responses may target additional epitopes c-terminal of the DPDN sequence. The highly charged c-terminal region of α-syn is a regulator of oligomerization, presumably by influencing the formation of intramolecular contacts.17 Agents binding to the mimicry domain, including the polyamine spermine, induce α-syn aggregation.18 By analogy, it is conceivable that immunoglobulins binding to the mimicry domain may induce α-syn aggregation. This may seem counterintuitive in light of the considerable attention currently being devoted to the antiaggregation potential of anti-α-syn antibodies. However, studies of prion protein have emphasized that influences imposed by immunoglobulins on protein misfolding propensity may be epitope-specific.19 In one study, immunization of wild-type mice against tau protein resulted in the formation of neuronal neurofibrillary tangles and other Alzheimer-type changes.20 Although the factors underlying these changes are uncertain, and may be related to the hyperimmunization protocol employed by these investigators, these considerations warrant prudent reassessment of the pleiotropic nature of antibody influences on neurodegenerative protein misfolding and aggregation. We demonstrate that a sizeable proportion of EBV-infected human subgroups are capable of generating antibodies that cross-react with α-syn, indicating possible mimicry. These findings may have implications with respect to the existence of α-syn autoantibodies in human sera. Autoantibodies formed in response to EBV infection are common, perhaps due to the ability of the virus to produce a persistent infection and trigger a sustained immune surveillance throughout the life of the host. Previous studies have suggested that anti-LMP1 immune responses are subdominant.13,21,22 However, we have demonstrated clearly detectable anti-LMP1 antibody responses not only in IM, but also in HD, indicating that such responses are not confined exclusively to acute EBV infection, but may occur in other settings, such as, for example, reactivation.12,13 Interestingly, anti-LMP1 responses may participate in the immune surveillance of EBV-associated malignancies, suggesting that they may have biological significance.23 The antibody responses demonstrated in this study are clearly biased towards the IgM isotype. Indeed, it is only the IgM responses of IM sera to peptide A and of HD responses to peptide L1 that show median values substantially above the normalized cutoff value of 1. Nonetheless, tables 1 and 2 indicate that a substantial proportion of patients from both groups show what are probably low-level IgG and IgA reactivities to these peptides. It would be interesting to know, particularly in the case of IM (acute EBV infection), whether subsequent analysis of samples from these same patients would reveal elevated titers of IgA and IgG antibodies, reflecting class switching from the original IgM response. Several investigators have reported the existence of α-syn autoantibodies targeting multiple epitopes in the sera of patients with PD as well as controls.2,–,6 The results of our study make it tempting to speculate that a proportion of these are actually generated against EBV. The existence of these autoantibodies implies a loss of tolerance to endogenous α-syn at some point in the lifetime of the individual. Molecular mimicry is a plausible candidate mechanism for this. We hypothesize that molecular mimicry induced by LMP1 may underlie the development of α-syn autoantibodies. Consistent with this possibility, Alvarez-Castelao et al.5 demonstrated that anti-α-syn antibodies were directed against the mimicry domain-containing c-terminal (aa 109–140) region of α-syn in a significant proportion of patients with PD and control individuals. Moreover, the amino acids around N122 (the asparagine residue which, when mutated, resulted in reduced antibody binding in the present study) were a major determinant for recognition by these autoantibodies. Other studies have demonstrated that anti-α-syn autoantibodies are multiepitopic, recognizing regions along the entire length of the α-syn protein.4 This may seem difficult to reconcile with a possible role for the mimicry domain, confined to a small region of the α-syn c-terminus, in the genesis of such a diverse repertoire of antibodies. However, it is important to acknowledge the concept of epitope spreading. Loss of tolerance may be initiated with immune recognition of an isolated, initial cross-reactive epitope with subsequent spread to other epitopes on the same antigen (intramolecular epitope spreading), or even to other antigens (intermolecular epitope spreading).24 For example, patients with lupus harbor autoantibodies to a large but limited number of autoantigens, including the spliceosomal protein SmB/B′.25 However, serial studies have revealed a consistent temporal pattern whereby an initial immune response confined to the PPPGRRP sequence of EBNA1 cross-reacts with the PPPFMRP epitope of SmB/B′.26 This initial mimicry event triggers a cascade of epitope spreading with the sequential appearance of autoantibodies to neighboring SmB/B′ epitopes, distant SmB/B′ epitopes, and other antigens.27 Validation of our hypothesis regarding an LMP1-induced generation of polyclonal α-syn autoantibodies will require similar serial serum studies. Several viruses have been implicated in the development of PD.28 Could this example of molecular mimicry with EBV have a role in PD pathogenesis? According to a currently popular model of PD pathogenesis,29 α-syn aggregation is initiated in the peripheral nervous system by some yet to be identified environmental trigger. Once initiated, α-syn aggregation propagates autonomously within and between neurons in a prion-like fashion. The self-propagating nature of α-syn aggregation permits consideration of a kiss-and-run mechanism, obviating the requirement for the persistence of the initial trigger. Thus, the absence of anti-LMP1/α-syn antibodies in late-stage PD sera, as demonstrated by us,30 does not exonerate them as disease triggers. A scenario consistent with our findings could be generation of antibodies targeting the mimicry domain during IM or EBV reactivation in susceptible individuals, leading to the initiation of α-syn aggregation, with subsequent dissipation of the offending immunoglobulins, but continued propagation of α-syn pathology. To our knowledge, no study has yet investigated whether a history of IM represents a risk factor for PD. The results of our study provide evidence for a biologically relevant mimicry mechanism involving the LMP1 protein of EBV and human α-syn. It will be important to examine large cohorts of patients with PD, particularly at early or premotor stages, for the presence of these cross-reactive antibodies. John Woulfe: drafting/revising the manuscript, study concept or design, analysis or interpretation of data, statistical analysis, study supervision, obtaining funding, principal investigator/guarantor. Madison Gray: drafting/revising the manuscript, study concept or design, analysis or interpretation of data, acquisition of data, statistical analysis. Munisha Ganesh: analysis or interpretation of data, accepts responsibility for conduct of research and final approval, acquisition of data, statistical analysis. Jaap Middeldorp: drafting/revising the manuscript, study concept or design, analysis or interpretation of data, contribution of vital reagents/tools/patients, study supervision. Funded by a grant from the Parkinson's Society of Canada and Parkinson's Society of Ottawa to J.W. Statistical analysis was completed by M.S.G., J.M., and M.T.G. J. Woulfe received research support from Canadian Institutes of Health Research, University of Ottawa, Physicians Services Incorporated Foundation. M. Gray and M. Ganesh report no disclosures. J. Middledorp is CEO of Cyto-Barr BV, Zuidhorn, the Netherlands. Go to Neurology.org/nn for full disclosure forms. Accepted in final form March 3, 2016.
. A possible role for humoral immunity in the pathogenesis of Parkinson's disease. Brain 2005;128:2665–2674.
. α-Synuclein and anti-α-synuclein antibodies in Parkinson's disease, atypical Parkinson syndromes, REM sleep behavior disorder, and healthy controls. PLoS One 2012;7:e52285.
. Naturally occurring α-synuclein autoantibody levels are lower in patients with Parkinson disease. Neurology 2013;80:169–175.
. Autoantibodies to α-synuclein in inherited Parkinson's disease. J Neurochem 2007;101:749–756.
. Epitope mapping of antibodies to alpha-synuclein in LRRK2 mutation carriers, idiopathic Parkinson disease patients, and healthy controls. Front Aging Neurosci 2014;6:169.
. α-Synuclein reactive antibodies as diagnostic biomarkers in blood sera of Parkinson's disease patients. PLoS One 2011;6:e18513.
. Autoimmunity due to molecular mimicry as a cause of neurological disease. Nat Med 2002;8:509–513.
. Monoclonal antibodies against Epstein-Barr virus cross-react with α-synuclein in human brain. Neurology 2000;55:1398–1401.
. Hypothesis: a role for EBV-induced molecular mimicry in Parkinson's disease. Parkinsonism Relat Disord 2014;20:685–694.
. Loss of UCHL1 promotes age-related degenerative changes in the enteric nervous system. Front Aging Neurosci 2014;6:129.
. Epstein-Barr virus specific marker molecules for early diagnosis of infectious mononucleosis. J Virol Methods 1988;21:133–146.
. Restricted low-level human antibody responses against Epstein-Barr virus (EBV)-encoded latent membrane protein 1 in a subgroup of patients with EBV-associated diseases. J Infect Dis 1999;179:1108–1115.
. Antibody responses to Epstein-Barr virus-encoded latent membrane protein-1 (LMP1) and expression of LMP1 in juvenile Hodgkin's disease. J Med Virol 2002;68:370–377.
. Localization and diagnostic application of immunodominant domains of the BFRF3-encoded Epstein-Barr virus capsid protein. J Infect Dis 1994;170:13–19.
. Immunohistochemical detection of the Epstein-Barr virus-encoded latent membrane protein 2A in Hodgkin's disease and infectious mononucleosis. Blood 1997;90:1664–1672.
. Role of sexual behavior in the acquisition of asymptomatic Epstein-Barr virus infection: a longitudinal study. Pediatr Infect Dis J 2005;24:498–502.
. Impact of the acidic C-terminal region comprising amino acids 109–140 on α-synuclein aggregation in vitro. Biochemistry 2004;43:16233–16242.
. Spermine binding to Parkinson's protein α-synuclein and its disease-related A30P and A53T mutants. J Phys Chem B 2008;112:11147–11154.
. Immunological mimicry of PrPC-PrPSc interactions: antibody-induced PrP misfolding. Protein Eng Des Sel 2009;22:523–529.
. Tauopathy-like abnormalities and neurologic deficits in mice immunized with neuronal tau protein. Arch Neurol 2006;63:1459–1467.
. Identification and prevalence of CD8(+) T-cell responses directed against Epstein-Barr virus-encoded latent membrane protein 1 and latent membrane protein 2. Int J Cancer 2002;99:93–99.
. Humoral immune responses to Epstein-Barr virus encoded tumor associated proteins and their putative extracellular domains in nasopharyngeal carcinoma patients and regional controls. J Med Virol 2011;83:665–678.
. Immune surveillance and therapy of lymphomas driven by Epstein-Barr virus protein LMP1 in a mouse model. Cell 2012;148:739–751.
. B cell epitope spreading: mechanisms and contribution to autoimmune diseases. Immunol Lett 2015;163:56–68.
. The lupus autoantigens and the pathogenesis of systemic lupus erythematosus. Arthritis Rheum 1986;29:457–460.
. Lupus humoral autoimmunity after short peptide immunization. Ann NY Acad Sci 1997;815:124–127.
. Epstein-Barr virus and molecular mimicry in systemic lupus erythematosus. Autoimmunity 2006;39:63–70.
. Viral parkinsonism. Biochim Biophys Acta 2009;1792:714–721.
. Parkinson's disease: a dual-hit hypothesis. Neuropathol Appl Neurobiol 2007;33:599–614.
. Absence of elevated anti-α-synuclein and anti-EBV latent membrane protein antibodies in PD. Neurology 2002;58:1435–1436.